In healthy people, infections with human cytomegalovirus (HCMV) normally do not cause any symptoms. By contrast, in persons with a weakened immune system such as leukemia patients in the wake of a bone marrow transplantation, the virus can lead to life-threatening complications. HCMV is also life-threatening for unborn babies. No other pathogenic agent is transferred so frequently during pregnancy from the mother to the fetus. A well functioning immune defense of the body normally keeps the viruses in check, primarily using its “innate arm”* with its prime “weapons” called natural killer cells (NK cells). A small portion of these killer cells has an activating receptor molecule called CD94/NKG2C on their surface. It is exactly this group of NK cells that multiplies strongly during an HCMV infection. So far, the molecular signals underlying this process had remained in the dark; now they have been deciphered. In order to determine the factors that are required for the specific NK cell proliferation during an HCMV infection, researchers in the department of Dr. Adelheid Cerwenka at the German Cancer Research Center (Deutsches Krebsforschungszentrum, DKFZ) cultivated HCMV infected connective tissue cells along with immune cells from the blood of healthy donors. They found out that specific immune cells – monocytes that carry the surface marker CD14 – are indispensable for the proliferation of NK cells carrying CD94/NKG2C because they produce a chemical messenger called IL-12. 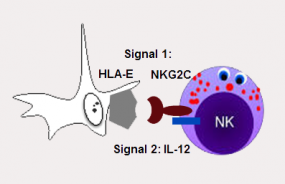 When the researchers neutralized IL-12, the NK cell proliferation was strongly reduced. However, not only the chemical messenger is necessary but also the actual presence of the CD14 monocytes. Cerwenka’s team additionally discovered that NK cells carrying CD94/NKG2C proliferate only if the infected cells exhibit the HLA-E molecule on their surface. HLA-E is the binding partner of the receptor CD94/NKG2C. It is closely related to the presentation molecules that are indispensable for antigens in adaptive immunity. HCMV infected cells increase the production of HLA-E.
“The activation of the NK cells by the cytomegalovirus is a complex process that involves many different molecules. We have now been able to identify a signal 1 (mediated by HLA-E) and a signal 2 (mediated by IL-12 and monocytes) that are both necessary for the proliferation of NK cells that exhibit the activating CD94/NKG2C receptor,” says Alexander Rölle, one of the two first authors of the publication.